Sukhvinder Dulay is a pension and benefits lawyer in Hicks Morley’s Toronto office. She assists clients with ongoing pension plan administration and governance as well as plan mergers, corporate transactions, and member communications. She also has experience advising on tax and employment issues related to compensation and benefits. 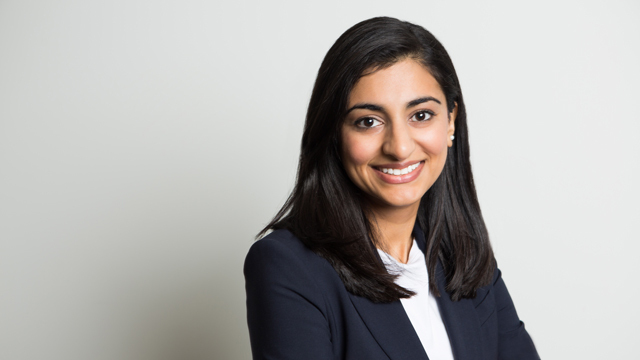 Sukhvinder’s advice on pensions, benefits and executive compensation is informed by her background in consulting and work experience in public sector human resources departments. She earned a Bachelor of Commerce and law degree from the University of Toronto and has previously worked at a large consulting firm and the Ontario public service. Sukhvinder has advised multiple clients on the strategy and implementation of complex plan design changes for both provincially and federally regulated pension plans, including plan mergers and asset transfers. Sukhvinder also regularly assists clients with plan documentation, day-to-day pension plan administration for both defined benefit and defined contribution plans, and governance issues. University of Toronto, Rotman School of Management, B.Comm. University of Toronto, Faculty of Law, J.D.